Anterior cervical discectomy and fusion (ACDF) is a surgical procedure to treat nerve root or spinal cord compression. It involves decompressing the spinal cord and nerve roots of the cervical spine in order to stabilize the corresponding vertebrae. ACDF is used when other non-surgical treatments have failed. to remove pressure from nerve roots or the spinal cord caused by bone spurs or a herniated disc. to stop the motion between two or more vertebrae. Removing pressure from the nerve roots or spinal cord can ease arm pain. Symptoms from pressure on the nerves, such as numbness or weakness in the arm or difficulty walking may also improve. Fusion of the affected vertebrae reduces mechanical pain caused from too much motion in the spinal segment. Anterior cervical discectomy is one of the most common surgical procedures for problems in the cervical spine. The term discectomy means to “remove the disc.” This procedure is routinely used to relieve pressure on a spinal nerve or the spinal cord caused by a herniated disc. 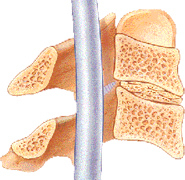 A discectomy is done when the surgeon intends to fuse two or more bones of the neck together. This procedure of disc removal and fusion (described below) is often used to treat degenerative problems (called spondylosis) in the neck. In the cervical spine, the disc is usually removed from the front. An incision is made in the front of the neck beside the trachea (windpipe). The muscles are moved to the side, protecting the arteries and nerves in the neck. Upon reaching the front of the spine, the surgeon uses an X-ray to identify the correct disc. The problem disc is removed all the way back to the spinal cord. If any bone spurs are found sticking off the back of the vertebrae and the surgeon thinks they may also be causing the patient pain, they may be removed at the time of surgery. Great care is taken not to damage the spinal cord and nerve roots. View animation. After the disc has been removed between the vertebrae, a cervical fusion is performed. The space where the disc was taken out is filled with a block of bone taken from the top rim of the pelvis. Bone taken from your own body is called autograft. Your surgeon may obtain bone from a source other than your body, called allograft. This bone is kept in a bone bank. Placing a bone graft between two or more vertebrae causes the vertebrae to fuse. The anterior cervical fusion may also be done in a way that spreads the vertebrae apart a bit, trying to restore the space between them. This is done to recreate the normal height of the disc space and to restore the normal inward curve of the neck (called lordosis). Increasing the distance between the vertebrae also widens the opening (foramina) where the nerves come out of the spine. Restoring the size of the foramina is done to relieve pressure and irritation from bone spurs where the nerves pass through the foramina. When an interbody fusion is done, the disc between two vertebrae is removed and a bone graft is positioned in its place. As the body heals, the graft fuses to the vertebrae above and below it. When more than one disc needs to be removed, a larger bone graft is inserted. Patients usually wear a brace after surgery. The brace limits movement between the vertebrae, increasing the chances for a successful fusion.